For the style stars who brave an entire month of jet-setting and fashion shows, we have to wonder, do they ever run out of outfits? The answer, of course, is a resounding no. Still, it's interesting to see what everyone's toting along to different cities. We kept our eye on New York's best street style as well as on the streets of Paris, but how do they stack up? We decided to take a look at how some of our favorite trendsetters dress for fashion week in New York and Paris and seeing how they tackle each city's signature style. 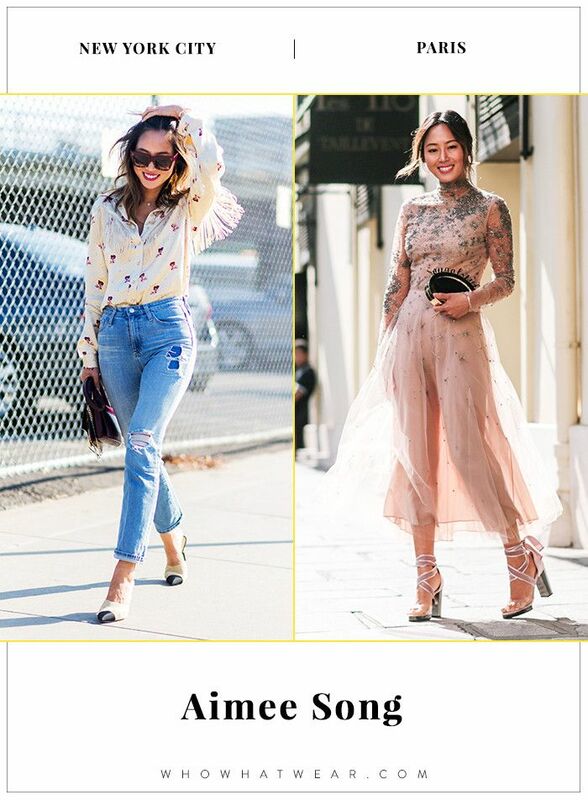 From the ease and edge of NYC's street style to the luxe and feminine looks in the City of Light, here's how fashion's It girls pulled it off flawlessly. The results—we'll let you see them yourself. Check it all out below! In New York: Ganni blouse; AG jeans; Chanel Satin and Grosgrain Pumps ($900); Céline sunglasses. In Paris: Valentino Embellished Dress with Tulle Overlay ($12,500); Valentino Velvet Sandals ($975). While in New York Aimee dressed up a pair of jeans with a fringed shirt and Chanel pumps. Meanwhile, in Paris she went for a more dressed-up combination of a ballerina-inspired Valentino dress and matching sandals. In New York: Acne Studios Howard Sunglasses ($410). In Paris: Erdem dress; Chloe Lexa Double Strap Shoulder Bag ($2050). The street style star wore a statement tee and a denim skirt on the streets of New York while in Paris she opted for a floral maxi dress and white boots. In New York: Altuzzara Paisley Dress ($2995); 3.1 Phillip Lim Hana Bag ($750). To give a maxi dress a more casual feel, Caroline Issa layered a T-shirt underneath while on the streets of NYC. In Paris, she went for a more polished look by pairing trousers with a floral blazer and finishing off her look with a belt. In New York: Balmain skirt; Gucci Crossover Leather Sandal ($1100). In Paris: Balenciaga jacket and skirt; Celine sunglasses. While Christine Centenera tends to stick to a few core styles, she put a polished spin on her look in Paris by swapping a T-shirt out for a structured suit set. In New York: Zara Frilled Shiny Dress ($50); Vintage bag. In Paris: Zara sweater and trousers; Ray-Ban sunglasses. Jenny Walton has proved time and again that she's a master at mixing vintage and affordable picks from shops like Zara. In New York, she opted for a breezy dress, while she went for statement pants in Paris. In New York: Saint Laurent Angie Velvet Blazer ($2490); Gucci Leather Belt with Double-G Buckle ($420). In Paris: Balenciaga Hourglass Double-Breasted Checked Wool Blazer ($2185); Ganni Gallery Accessories Bag ($445). While Pernille polished off her looks with a blazer no matter her city of choice, a denim skirt and flats kept with New York's edgier feel, while white boots and a structured bag felt perfect for Paris. In New York: Balenciaga Swing Denim Jacket ($995); Norma Kamali Square Cat Eye Sunglasses Tokyo Tort ($98). In Paris: Marques Almeida dress; Alaïa Studded Sandals ($1760). Taylor Tomasi Hill is a master at creative layering, and while she put a cool spin on sneakers and a denim jacket in NYC, she opted for a sleeker look across the pond. In New York: Christopher Kane dress; Giuseppe Zanotti sandals; Proenza Schouler PS1 Mini Shoulder Bag ($890). In Paris: Chloe dress; Miu Miu Leather-Trimmed Velvet Ankle Boot ($975). Dresses and platform shoes were a universal must for Yasmin Sewell, but glamorous touches like lace and velvet made her Paris look a touch more precious. In New York: Google Short Sleeve Hero Tee ($17); Gucci Leather Knot Sandal ($795). In Paris: Loewe Leather Coat ($4600); Hermès bag. We can always count on Miroslava Duma to look perfectly put together, but while jeans were her go-to in NYC, she swapped them for a luxe leather coat in Paris. Want more street style inspiration? See all the best shots from Paris!